More and more frequently we hear people advocating for online giving. Church management systems (CMS or ChMS for short) like Churchteams offer online giving. So what exactly is this thing called “online giving?” It’s when church members give money to your church using credit or debit cards through the portal of the Internet. Many “Church Experts” claim that online giving is positive, safe and preferable to older methods of receiving donations, but I think it’s high time someone came out on the side of truth; online giving is dangerous and it will bring a curse upon any church employing it. CHRISTIANS BEWARE!!! Below are 5 reasons you should turn and run whenever someone mentions “online giving”. Easy Recurring Gifts = Lazy Church Members – ChMS and Online giving services allow church donors to easily set up recurring gifts. These church members give a specified dollar amount consistently every month…sometimes more than once-a-month. Can you imagine what this does to our precious disciples? Something as sacred as tithing should never be boiled down to a “set-it-and-forget-it” mindset! So what if recurring gifts make your church’s income more predictable and steady. So what if online giving helps more people give consistently. Such laziness cannot be allowed. Tithing is a sacrifice. Therefore, each time one gives, they should sacrifice their time as well as their energy by dutifully writing a check and bringing it to church. Cash is okay too, of course, but it generally takes more effort to write a check, so I believe checks are the godliest form of giving. Checks Are Good Enough – Online giving is simpler than writing a check, but checks are simply good enough. Why do we need to always “change with the times?” When is enough enough? Are we not commanded by Scripture to “conform not to the patterns of this world”? Just because online giving is simple, does not mean we should mindlessly adopt it. Writing a consistent tithe check is a time-honored tradition. Besides, I’ve witnessed check-writing increase a man’s dexterity and speed. How so? Each time the pastor would pray for the offering, this man would remember that he’d forgotten to write his tithe check. His reserved seat was on the third pew, so he developed very fast check-writing-skills. Was it easy? No. But it built his character and physical prowess. No one ever honed such abilities using a credit card. Technology Is Evil – Let’s face it, the further we go with technology, the more awful the world becomes. The Internet is a tool of Satan that is stealing the minds of our young people. Do we really want to begin using something so horrible for something good like raising money for ministry? Since when do we need church management software systems to manage the church? I thought that’s what committees were for! We are called to be Holy which means “set apart.” Adopting online giving technology does not set us apart, it makes us more like the world. For me the bottom line is this: I just want to drive my new car to church and sit in the air conditioned comfort of our brightly lit auditorium without being surrounded by the evils of technology. No more “slumps” in giving during seasons when people are less likely to attend church. But consider for a moment how dangerous those three supposed upsides really are. All this talk about cash flow projections makes the church sound too much like a business. The church shouldn’t need to use business-like language. We should be trying to get businesses to become more like us, instead of us becoming more like businesses. How about the “slumps?” They are wonderful tools of God because they build our faith. We wouldn’t want to rob God of opportunities to stretch our faith when money is tight would we? And who cares about a happy finance team? Since when is happiness an important part of church life? Jesus died to make us holy, not happy!! A healthy church is one where people have stern faces and a sober countenance. Those are the visible evidences that God is working in their lives! The Offering Plate is Sacred – My biggest issue with online giving is that it robs people of the opportunity to physically place their sacrificial offerings in the offering plate. I’ve never seen a ChMS that included an offering plate! I grew up putting my offering in the plate. To me it’s sacred. Besides that, giving is an act of worship. 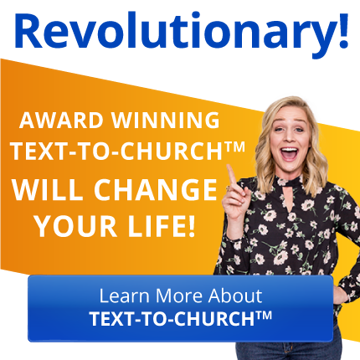 How can a person possibly worship while clicking a “give now” button on their Internet-connected-device? Finally, the offering plate is biblical. When Jesus praised the widow for giving her two mites, the Scripture says that people were casting their money into the treasury. Back in the 1970s I heard a preacher say that the Greek word for “treasury” meant “Twelve-inch round golden plate with red felt in the bottom.” At least, I’m pretty sure that’s what he said. Anyway, I think it’s pretty clear how troubling online giving is. It’s up to those of us who love the Lord to raise the alarm and talk our fellow Christians out of falling prey to this evil trend. Let us join together in this holiest of crusades!